Oats are high in fiber and are known to have several health benefits, including lowering LDL cholesterol. I've been trying to include oats into our meals in several ways. So when I saw this recipe, I thought of trying it out. 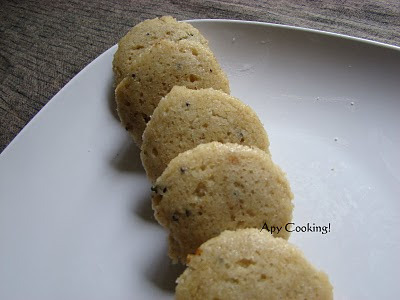 And of course, this is another of those idlis which don't need soaking, grinding or overnight fermenting. Except, again, for the few seconds of grinding of the oats. I halved the ingredients of the recipe and also added some of my own - ginger, urad dal and curry leaves which are a must have for me when I make any seasoning. In a pan, dry roast oats for a few minutes until slightly brownish. Cool and pulse in the blender to get a coarse powder. In the same pan dry roast rava for about 5 minutes until light brown. Cool and mix with powdered oats in another vessel. Add baking soda, salt ( I added a little more than a teaspoon), mix well and keep aside. Heat oil, mustard seeds, chana dal, urad dal, finely chopped green chillies, curry leaves, ginger. Add the seasoning and coriander leaves to the oats-rava mixture and mix well. To this add curd (yogurt). If the curd is thick, whisk it well with a fork or a whisk and then add it. Also, Usha suggests to add curd only to the mixture that you would use instanty. If you feel the mixture is extra, refrigerate it for later use. Add curd as and when required. Steam in an idli stand for 7 to 8 minutes. The instant oats idli was an instant hit with my family, specially my son who loves idlis and did not really notice that this was a different type of idli than his favourite vermicilli idli. hey, that is a great one dear. As you used a bookmarked recipe, please feel free to link it to my bookmarked recipe event. I like the oats in idly. It makes idly more healthier. nice with chutney. I love variations in idlis and dosas. Will keep this one in mind! Thanks, Aparna! Nice recipe aparna, very healthy and a nice change from the usual idli..
healthy oats idly looks awesome.. new to me.. thanks for your comments on my blog.. following you..
Never tried this..looks lovely..will surely try this. 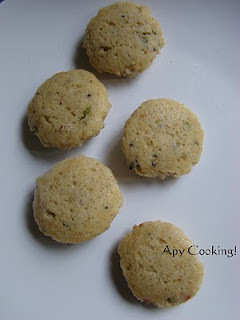 Oats Idli was a popular recipe from usha's blog this month - thank you for participating in T&T. Healthy and delicious treat. Good to be here. Best wishes. First time here....Nice blog....HEalthy idly..even I made them..